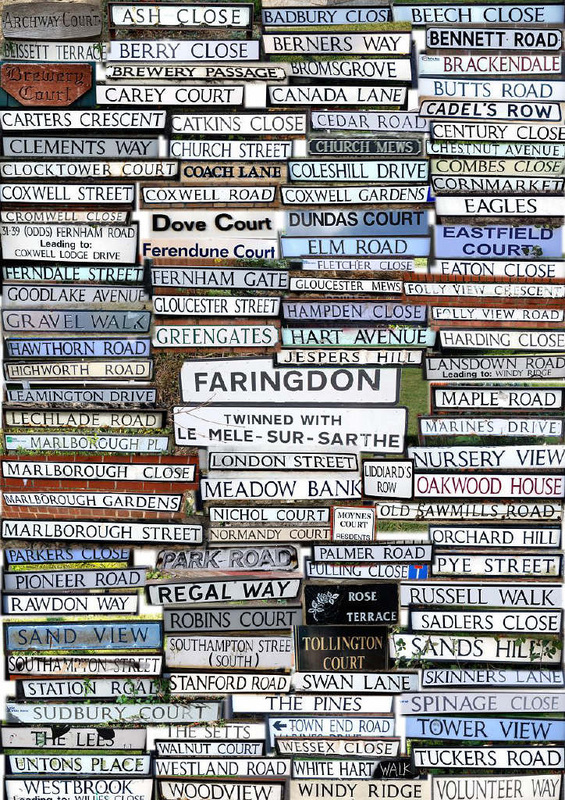 Faringdon Street Names - Faringdon Community Website. Faringdon's importance came from the crossing of two ancient ways: one from London, via Oxford and Abingdon, to Cirencester and on to Gloucester and South Wales, or to Bristol, Bath and Somerset; the other from the North of England, via Coventry and Burford, to Marlborough, Winchester and Southampton. These routes were of such importance that the main streets were named after the places that they were leading to: for example Southampton Street, London Street, Gloucester Street and Marlborough Street. The earliest reference that has been found to Southampton Street has been in a deed of 1815, before that it was simply called Suthstrete in 1399 and South Street in 1464 and then from 1537 it was known variously as Hampton Street or Southampton Street. The other two streets do not seem to have changed their names. Faringdon was divided into two tithings, the boundary being the brook which now runs under the Narrows dividing the Market Place and the Corn Market. The tithing to the east of this brook was called Port and the one to the west was called Westbrook. For a long period of time deeds only referred to these two tithings and the main streets. In 1551 the centre of Faringdon was referred to as Highe Strete als Chepe Strete. Later it became Market Place presumably because the market, a Charter being granted by Henry III, was held there. Part of it however was referred to as Port Well in deeds of the late 18th and early 19th centuries. The other streets leading from the outskirts of town indicate the direction in which they are heading, such as Lechlade Road, Coxwell Road, Stanford or Wantage Road, Highworth Road, Fernham Road and Radcot Road. * indicates streets and names no longer extant. Church Street - indicates that it runs by the parish church. Crown Yard* - a small yard behind the Crown Hotel and which had a few small cottages there in the middle of the 19th century. Coach Lane - had been known by the name of Coach House Lane and this is more appropriate as it seems too narrow for coaches to pass through it. Pump Alley - pedestrian alley between London St and Ferndale St. There was was a stand pipe on the left, at the Ferndale St end. Foundry Lane* - led from Marlborough Street. The foundry it led to was owned by a man called Frank Lane. Pound Close* - off Gloucester Street, near the junction with Lechlade Road there is a small lane which used to be known as Pound Close, probably after the pound where stray animals were kept, which was nearby. It is referred to by this name in deeds of the 17th and 18th centuries and then in a deed of 1876 it is referred to as Parsonage Lane. Queens Arms Yard* - behind the Queens Arms public house in Coxwell Street. Station Road - was originally Butts Road but at the advent of the railway it was renamed Station Road as far as the station and Butts Road thereafter. The only part of Station Road now remaining is from the Coxwell Road/Gravel Walk crossroads up to The Swan public house and then it becomes Park Road. Swan Lane - in a deed of 1811 was called The Lane. It was given its present name after the Swan public house which was at the junction with London Street. Tan Yard Lane* & Chapel Walk* - both led off Bromsgrove, one to a tan yard and the other to the Strict Baptist's Chapel. White Hart Walk - the White Hart public house which stood on the corner of the Gravel Walk/ Marlborough Street crossroads. Windmill Lane* - mentioned in the census of 1841, was by a windmill on Stanford Road. Commemorative College Row* - mentioned in the census of 1181, was probably so called after Oriel College which owned a large amount of land in and around the town. Ferendune Court - the Saxon name for Faringdon was fearn - fern-covered, and dun - hill. 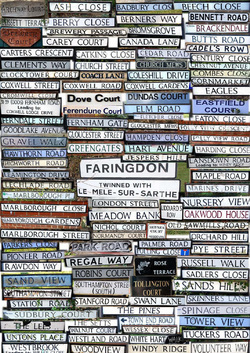 Faringdon has been spelt in many different ways over the centuries including Farendon, Chepyngfarendon and Farington. Eagles - named after the Eagle Motors car repair workshop and stores which was at the junction of the Eagles and Park Road. Harness Lane* - first mentioned in 1551. It was the first part of Southampton Street where it exited from the Market Place, possibly named from the goods produced there. Marines Drive - during World War II the Royal Marines had a camp there. Old Sawmills Road - named after the timber sawmills which was in Butts Road, now Park Road, from about the 1890's to 1961. Regent Mews - the Regent cinema used to be on the site. Alfred Woods Close- Alfred was born in Block Green on 9th August 1899 to Sarah Woods and an unnamed father. In 1901 he was still living there at his Grandparents house whilst his mother was working as a Domestic Servant in Little Coxwell. Little is known of the next ten years or so of his life apart from the facts that his Mother married Thomas Edgington around 1903 and his Grandfather Fred Woods dying in 1904. Next official records show a 13 year old Alfred Woods embarking the SS Tunisian at Liverpool on the 17th May 1913 bound for Montreal, Quebec under the 'Church of England Waifs & Strays Society' He remained in Richmond for the next 2 years working as a Farm Hand but joined the 87th Btn. Canadian Infantry (Canadian Grenadier Guards) on the 10th November 1915 lying about his age, saying he was 17 years six months (which would make him 18 and eligible to serve overseas when the Regiment shipped out) when in fact he had just turned 16. The 87th embarked for Britain on 23 April 1916. It disembarked in France on 12 August 1916, where it fought as part of the 11th Infantry Brigade, 4th Canadian Division. Alfred was Killed in Action on the 21st October 1916 during an attack on Regina Trench, near Courcelette, Somme, France. His remains were never recovered/identified and he is commemorated on the Vimy Memorial. He died aged 17. Arthurs Hill - H. N. Arthur, a coach and harness maker, whose business was located on the end of the hill nearest the roundabout. Bennet Road - the Bennett family owned Faringdon House during the 19th century and the last member of the family died there in 1918. Cadels Row - the family of Cadel have been recorded in the Parish Registers of Faringdon since the 16th Century. The firm of Cadel the builder had premises in Church Street and in Southampton St.
Cromwell Close - Oliver Cromwell came to Faringdon in April 1645 and summoned the Governor of Faringdon House, which was held for the Royalists, to surrender. The Governor refused and Cromwell attacked on April 30th. He failed to subdue the garrison and left a few days later. Eaton Close - there was a family called Eaton here during the 18th Century. Goodlake Avenue - the Goodlake family lived at Wadley House during the 19th and early part of the 20th centuries and left money to the Westbrook Blanket Charity for the benefit of the poor. Mrs Mary Goodlake gave some stocks and shares to The Cottage Hospital in 1909. Hampden Close - Sir Robert Pye married John Hampden's daughter a year or so before the Civil War broke out and one of his sons was named after him. John Hampden was a Member of Parliament and brought differences between King and Parliament to a head by his refusal, on principle, to pay Ship Money, a subsidy which the King was demanding without the consent of Parliament for the maintenance of the Royal Navy. Harris Yard (no longer exists) - Gravel Walk had a small yard leading off it which was called Harris Yard, perhaps because a member of the Harris family lived there or owned it. Liddiards Row - the Liddiard family owned grocery and wholesale businesses in the town, and gave land to various clubs. Both George Ernest Liddiard and Leslie Ernest Liddiard became Chairman of Faringdon Rural District Council, the former in 1929-1930, 1931-1935, and the latter from 1968 to 1970. Nichol Court - Elsie Nichol was Town Mayor from 1983 to 1987 and was greatly involved with local events and charities. Parkers Close - a business man named Parker owned a corn store, tea rooms and shop in Marlborough St from around 1895 to the early part of the 20th Century. Pulling Close - the family of Pullen or Pulling can be traced back to the early part of the 18th Century. Pye Street - the Pye family bought the Manor of Faringdon in 1623. Sir Robert Pye, the second of that name, supported Parliament during the Civil War while his father sympathised with the Royalists. Another member of the family, Henry James Pye, built the present day Faringdon House in the mid-18th century and was Poet Laureate about 1790. It is said that the nursery rhyme 'Sing a song of sixpence' was written about him, as he was such a poor poet. Rawdon Way - Sir Marmaduke Rawdon was a famous Cavalier soldier. A slab in the church has an inscription, partly obscured by a choir stall, that says 'this stone was placed here by Marmaduke Rawdon Esquire', but it is not clear whether it marks the grave of Sir Marmaduke. The Governor at the time of the surrender of Faringdon House, June 1646, was Sir George Lisle, but he was in Oxford so the acting Governor at the house was Sir William Courtney. He was also in command of Sir Marmaduke Rawdon's Regiment. Untons Place - the Unton family owned Wadley Manor and became Lords of the Manor of Faringdon in 1590. The last male member of the family to hold the manor was Sir Henry Unton. He was a courtier at the court of Queen Elizabeth. He fought against the Spanish in the Netherlands earning his knighthood at the battle of Zutphen in 1586. He became the Ambassador to France in 1591. He gave the Portwell to the town and left money to be used in charitable causes for the relief of impotent and poor people of the town. Butts Road - was probably called this because of archery butts erected for practicing the art of the bowman, the earliest reference to this name was in 1551. Canada Lane - the road by the Infants School was known as Canada until in the middle of the 19th century it became Gas Lane or Gas House Lane because the Gas Works were built there. After the demolition of these works it reverted to its name of Canada Lane. Canada, being a country far away, was often used for an area on the outskirts of a town to indicate it was quite a way from the centre. Ferndale Street - the road now known as Ferndale Street was known for many years as Back Street as it ran along the back of London Street. When the Faringdon Union Workhouse was built on it the name was changed to Union Street and when that was pulled down in 1968 it became to be called Ferndale Street after some cottages that were called Ferndale Cottages. Skinners Alley - between London St and Ferndale St. It was originally Colliers Lane or Row and as such was referred to in deeds of 1689. The family name of Collier was in the town during the 16th and 17th centuries so presumably they had a business there or owned the land. The name was changed in the late 19th or early 20th century and called Skinners Alley after Skinner's Bakery which was located at the junction of this lane and Union Street (now Ferndale St). Tuckers Road - a Nursery which was owned by the Tucker family was on this site. Robert Tucker was Chairman of the FRDC from 1958 to 1960. Volunteer Way - in the late 19th early 20th centuries there was a place to the left of Butts road where there was a volunteer rifle range called the butts, this was used by a detachment, 'K' Company, of the 1st Volunteer Battalion Princess Charlotte of Wales Regiment (Royal Berks).